I was out on Dutch Creek Road Saturday and saw that some kind soul was feeding gourmet bird food to his/her feathered friends. There were 8 or 9 male cardinals in the area. I stopped my Jeep and took numerous shots from the window. This is not the best of my shots, but I had to save those for actual paying gigs, but you get the idea. 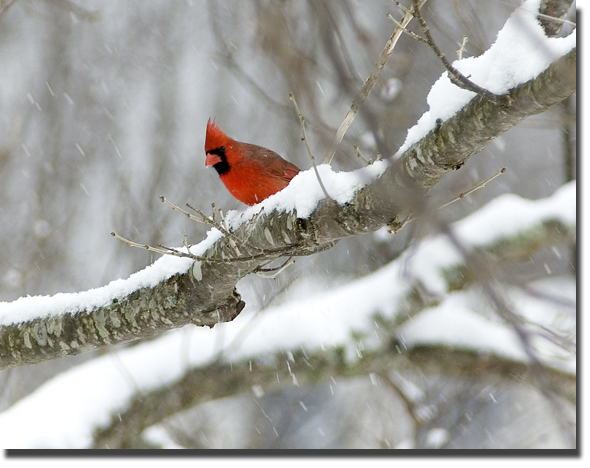 So I finally bagged the elusive cardinal in the snow shot. For the record...the snow is all gone and I will soon ditch this joint and take Harley for a long winter walk through the mountains.